A sheep stranded on a steep cliff in the Lake District for three weeks has been rescued. 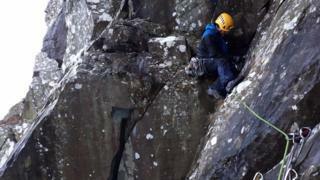 The animal had been unable to get down from the narrow ledge near Bull Ghyll at Honister Pass. 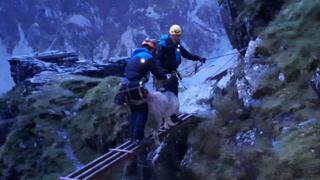 Volunteers from the Cockermouth Mountain Rescue Team climbed the crag to reach the sheep, and at one point clipped it on to a fixed climbing cable to help it cross a metal bridge. A spokesman for the team described it as an “epic and daring rescue”. The fixed cables – a climbing system known as Via Ferrata – are attached to a rock-face route, once used by Victorian slate miners, and now by tourists. Why are dusters often yellow?